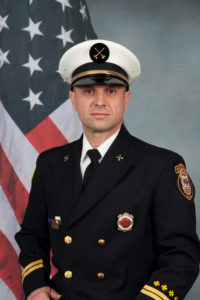 Hi, my name is Andy Dina, and I have been a member of the fire service for 30 years. I currently work as a division chief for the Naperville (IL) Fire Department, where I have just completed my 27th year of service. The Naperville Fire Department employs more than 200 personnel and operates out of 10 fire stations. We have six front-line engines, three front-line ladder trucks, one front-line heavy rescue squad, eight front-line paramedic ambulances and two command vehicles. At age 46, during a routine annual fire department physical, I discovered that I had prostate cancer. With much research, second opinions and the help of my wife, we chose one of the many treatment options that were available to me. I never thought to contact the Firefighter Cancer Support Network (FCSN) until a close friend and cancer survivor recommended it to me. The support I received was awesome, and to this day, I use the toolbox that the FCSN supplied to help organize my medical files. After many conversations with my mentor, I realized how important it was to have a peer to talk to, somebody with a similar diagnosis and treatment who simply understood what I was going through and how I was feeling. Today, nearly 7 years later and cancer-free, I still keep in touch with my mentor from time to time. I wanted to pay it forward and help others the way the FCSN helped me during a difficult time in my life, so I contacted the FCSN and applied to be a mentor. Since then, I have dedicated some of my time to mentoring firefighters from around the country who are suffering the devastating news of a cancer diagnosis. I have met some interesting people and made some long-distance friendships along the way. About five years following my cancer diagnosis, my wife was diagnosed with breast cancer, she was 47. After finding the right doctor and treatment option, we made a call to the FCSN. It was amazing to find that my wife received the same exact support from the FCSN that I did. She received a tool box and was connected with a wonderful mentor who had nearly the same cancer type and treatment my wife was receiving. Today, my wife is cancer free and continues to talk to her mentor. The FCSN was also there for me by supplying educational material to our department, which enabled me to deliver training on the effects of cancer in the fire service and steps we could take to prevent it. Today the Naperville Fire department is a leader in cancer prevention and awareness initiatives in the fire service where we are always looking for ways to improve our practices to further reduce the cancer risks our firefighters face every day.